HAPPY BIRTHDAY MMMMMMMMMOOOOOOOMMMMMMMM! 🙂 Your b-day card sounds really cool! We have been so busy out here. It is good to hear that the ward is doing great! This last week we had some training in a cool stake center in LA by the USC campus. It had its own parking garage too! In the training we talked a lot about the doctrine of Christ. President Weidman also shared that no one would miss a plane, so they arrive early, about two hours. Then he stressed how much more important a church meeting is than a plane ride. Bet the missionaries late to the training felt bad, we got there with two minutes to spare! Then we learned how to be bold and full of joy when we extend Book of Mormon invitations. The last bit was pretty interesting. With the past mission president we were to strictly obey the white bible, and a extra binder full of rules was given. Along with that there was some major disobedience, over twenty missionaries got sent home just before I came in. President Weidman said, ” The white missionary handbook is only the terrestrial law, celestial missionaries are consumed with their purpose”. I have made a personal commitment to be a celestial missionary! With the recent changes in missionary work it feels like we are being called to live a higher law. I have been talking with other elders out here and they feel also something even bigger is coming to missionary work! Can’t wait for the next general conference! That is super neat that you guys are doing a blog! Thanks! Thank you for the bank stuff, I have not bought a bike and don’t know if I will… We got in a little accident. We were at a red light and this lady drove into us, yes she was texting! Everybody was ok. Our trunk and bike rack are dented though, but still work! I was hoping you could send me my Invicta watch in the yellow case, cause a lot of the elders out here wear them…. idk though it is pretty prideful?! 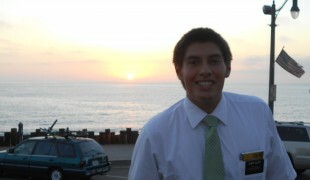 Elder Campbell is from Fort Myers, Florida. He is 22 yrs. old and has been on his mission for almost 6 months. … This next transfer is crazy! No one but the Lord knows what will happen! I’m pretty sure I am leaving the area. Samoan elders are coming, and they would probably take our area. I don’t think I will train, usually you have to at least finish the 12 week program. I got the opportunity to be interviewed by President Weidman. ( He interviewed everybody this week) I was probably the shortest interview I think. Not longer than 10 mins. (some people were in there over an hour…my companion) President Weidman told me he really likes my smile. He says that it lights up the whole room. He told me to smile more genuine though and more often. Kinda weird. He then told me he thinks I have some very good leadership skills and that I will be needed soon. Then in the closing prayer he asked for growing experiences from me. Just recently I got to go on splits with the zone leaders. They are really great missionaries and cool guys! My district will be starting a beta missionary program that we just came up with. It is called “U-Night”, one of the ZL’s received a book from home that had this success story in it. We will be trying that in our area. It deals with a lot of member work, which is the future. More info will be coming on that, but I am SUPER EXCITED about it! We have recently been teaching an investigator we met street contacting. She is a surfer and seems pretty cool. We had already taught her two lessons when she dropped us. We then asked if we could stop by one more time to talk, and she said yes! The issue is she doesn’t believe in Heavenly Father and believes nature is the higher being. Has been kinda difficult because her questions have been deep about after this life. Meeting with her today with the bishop. Please pray that it goes well!!!! Well that’s about it & I LOVE YOU MOM AND DAD!!! P.S. Got my first Californian haircut today! A Samoan member of our ward does it for free! He know lots of cool people, like Austin Rivers (NBA player) who’s hair he cut also! I GOT MY HAIR CUT BY THE SAME GUY WHO CUT A NBA PLAYERS HAIR! 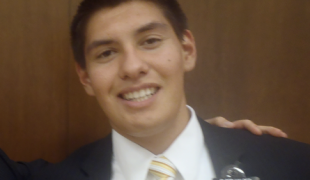 I am serving a mission in Los Angeles, California. I love sports and being outdoors. My favorite fruit is strawberries.